With their soaring ceilings, dramatic voids, flexible spaces, natural light-filled interiors, cross-flow ventilation and outdoor living options, The Zinc Terraces in the Green Square precinct are winning praise for their breakthrough design. The six three-storey Torrens Title terraces at 221-225 Queens Street Beaconsfield total 152sqm internally plus an additional 40sqm of external space. They have three bedrooms, three bathrooms, a top-level 'parents retreat', an internal courtyard, front and rear garage and a high level of finishes and inclusions. The Zinc Terraces also contain a practical space with a bathroom and kitchenette built above the garage known as a 'Fonzie Flat' - a euphuism for the studio occupied by 'The Fonz' above the Cunningham's garage in 'Happy Days'. "We've taken the raw concept of a grand Victorian terrace and redesigned contemporary living spaces, integrating principles of sustainable designs as a commitment to responsible living for the future," said Gustavo Thiermann of Ink Architects. "We've stacked three levels of living, sleeping, entertaining, and working zones to give residents the flexibility to seek out, and find, a variety of spaces." Peace and privacy: There is no-one living above or below you. Solid masonry walls separate each terrace, maximising lateral acoustic separation. 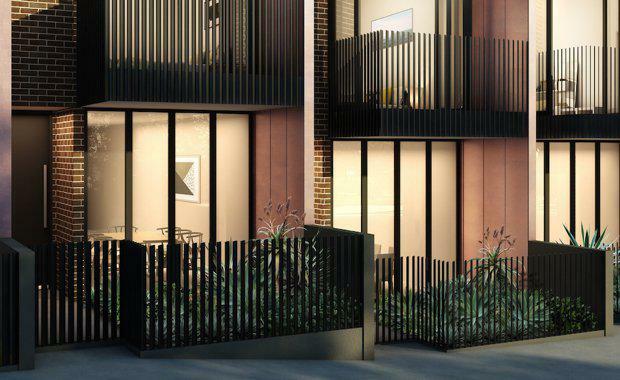 Street presence: Unlike an apartment, The Zinc Terraces have a separate entity from the street, with a fence, mailbox and front yard, establishing a sense of connection with the neighbourhood. Diversity of space: Most Sydney apartments can be seen an understood in as little as one glance. These terraces, however, have interesting and flexible spaces to explore on every floor. Outdoor options: Most people who move from a house to an apartment bemoan the loss of a front and backyard. These terraces have both. Natural light: Skylights and an open void bring natural light to the vertical circulation spine. All spaces are open to the morning or afternoon sun. Solar access: Large retracting glass panels allow internal spaces to flow seamlessly to a sun drenched courtyard at ground level. Bedrooms enjoy the connection with extensive balconies that provide district views. Entertaining: The rear lane garage connects to the internal courtyard and can be transformed into covered entertaining space. Storage: Generous wardrobes and storage spaces have been cleverly integrated into the slick design.